Author bio: She is former Disney Cast Member and a best selling travel writer. 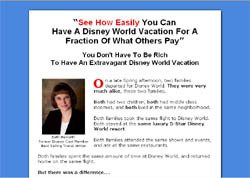 Blurb: Ex-Disney Employee Reveals Insider Secrets. “The Ultimate Disney World Savings Guide” is the most comprehensive book you can find about Disney savings and planning strategies. It is a guide to the best tips, tricks and savings available for a Disney Vacation. It’s everything I've learned and discovered in making a Disney Vacation an affordable and magical experience. -How to save upto $500 (and more) – just on Disney ticket costs alone! -Exclusive discounts on 5, 7 and 10 day park hopper tickets! -When exactly are the high and low price seasons when visiting Orlando and Disney World? -How to shop around for the best buys. Find out which websites are the easiest to use when looking at alternate vacation dates. -What airlines are the most stable – and which aren’t. -Did you know Disney offers a free “Magical Express” shuttle and baggage service? -Dining Out – Dining can be expensive at the major resorts. We’ll show you how to slash your food expenses – without sacrificing the fun of eating out! -Expedition Everest! Find out what's the hottest rides – and most talked about shows this season – and how to score the best seats in the house. -The one park you should visit last! -Hungry? Find out what’s OK to bring inside the parks with you – and what you should leave at the hotel.